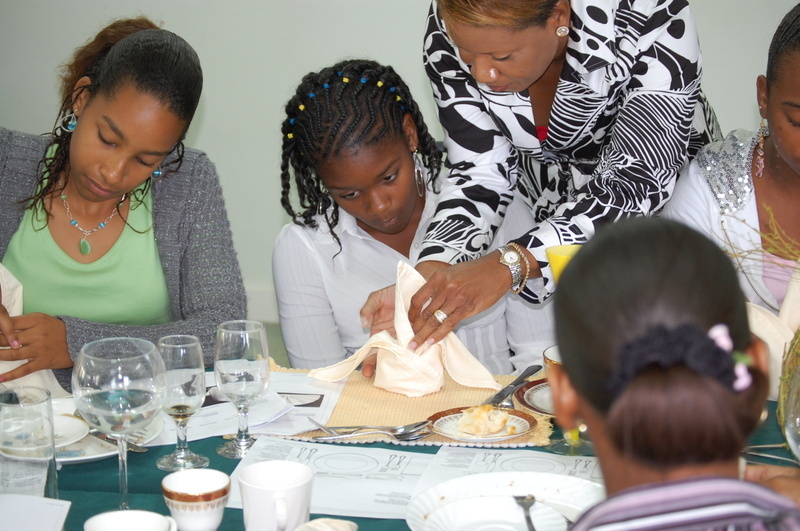 At the Etiquette & Protocol of the Bahamas, we believe in being well-rounded, therefore not only will we teach your tweens and teens how to properly conduct themselves, but we will teach skills that enable them to be successful throughout their entire lives. Application of these skills will enable your tween or teen to speak diplomatically, improve self esteem and increase self confidence, as your child will be well equipped to function in any environment. This program is highly interactive, hands-on, educational and fun, and our wellness session is conducted at a local gym. Our final session is a private banquet held at the British Colonial Hilton where students put into practice their newly acquired skills of ballroom dancing and dinner conversations with distinguished members of society, while showcasing their ability to successfully navigate a four-course meal -- dining Continental Style and employing the Silent Code of Service methodologies. Give your child the edge that he/she needs to be successful in life. The edge that will allow your child to stand out, be noticed and afforded opportunities not presented to the average tween or teen. Enroll your tween or teen in the next Total Image Management & Social Skills Development session at The Etiquette & Protocol School of the Bahamas. Week 1 - Making a Great First Impression! It takes just a quick glance, maybe three seconds, for someone to evaluate you when you meet for the first time. In this short time, the other person forms an opinion about you based on your appearance, your body language, your demeanor, your mannerisms, and how you are dressed. These first impression can be nearly impossible to reverse which is why it is extremely important to make a positive first impression. Week 8 - Graduation Gala Event! © 2008 Total Image Management & Communications Co, Ltd. Learn more about Total Image Management & Communications Co.
Stacia Williams is a Corporate Image Management, International Protocol, and Personal Branding Consultant who helps executives and organizations to always be at their best. Polished to perfection is her promise. Based in the Bahamas, Stacia sets the standard in the Caribbean for Personal Brand and Image Management.